The Pre-Alpha Phase Has Ended at Long Last! The end of the pre-alpha phase is almost here! From September 1st, we're going to stop all sales of Atomic Society through our website. After that, you'll have to wait until the Steam launch later in the month to try the game. Our reason for doing this is that we want to draw a clear destination between the pre-alpha period and the upcoming Early Access phase. I wouldn't want people to buy the game now thinking it’s going to be permanently available on Humble. Given our very limited means as a developer, we have to commit fully to one storefront, and it makes most sense to go with Steam. Therefore if you’ve been sitting on the fence about buying Atomic Society, and have any interest in the early backer Special Edition rewards, you have until September 1st to get them! If you own the game already, you’ll still be able to play and download the game between now and our Steam release, of course. It’s just new sales we’re going to stop until the game hits Steam. 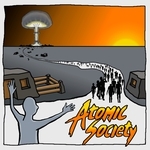 I have just taken the rather odd step of stopping all sales of Atomic Society until we launch on Steam. That officially ends the pre-alpha phase! No more early backer rewards. Huge thanks again to everybody has bought it and inspired and financially helped us even get this far. It would have been literally impossible after a failed Kickstarter to have made the game people are playing today had people not taken a chance of us by playing a very unfinished game. Next stop Steam. The version we'll launch on there is going well. Over 30 improvements added ready, including some big new features like religion and player goals. Remember to wishlist us here and you'll get an email when the game is released. Existing customers can still download the current version from Humble until we release on Steam.